A shooting script from Doctor Who series four is being offered for auction to raise money for the National Literacy Trust. The signed script was used by actor Steve Pemberton who played Strackman Lux in the two-part 2008 story Silence in the Library / Forest of the Dead. The script is dated 11 January 2008 and signed by Pemberton. The National Literacy Trust works to improve the reading, writing, speaking and listening skills in the UK's most disadvantaged communities, where up to 40 per cent of people have literacy problems. Bids can be made at the NLT auction website. For today only you can rent Voyage of the Damned for 13 pence from online video catch up and rental service SeeSaw. The deal is part of the site's Christmas Advent Calendar which offers episodes at reduced price for one day only. You can rent the episode by clicking here. You get 30 days to start viewing the episode after you purchase it. 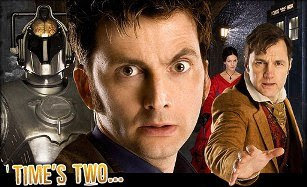 You can also rent two other Christmas Specials, The Christmas Invasion (£1.19) and The Next Doctor (99p). SeeSaw also offers some Classic Series episodes for free including The Tomb of the Cybermen. Doctor Who Series Four has won the second SeaSaw Tight Tuesday vote. The entire series will be available to rent for 99p on Tuesday 5th October. Users will then have 90 days to watch the series. French Doctor Who fans are petitioning the French DVD distribution company to release Series Four of the show in the republic. Organised by the website Beans on Toast the petition calls on France Television Distribution, not only release the series in the French language but to ensure the DVD release is of high quality. Series 1 - 3 have all been released, dubbed into French, but with none of the extras familiar to English speaking viewers included. The first two series had the English versions of the soundtrack included with French Subtitles, but this was not available for Series Three. There are currently no plans to release Series Four in any form.